Queens Comprehensive Dental Services, Dr. Mark Molinsky, General, Implant and Cosmetic Dentist serving Forest Hills, New York, 11375. 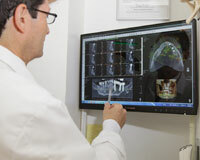 Our practice utilizes state-of-the-art, full-cranial cone-beam CT (computed tomography) technology that provides highly accurate 3-D radiographic images for the diagnosis, planning and treatment of Dental Implants. Undistorted, anatomically correct views of the jaws, teeth and facial bones along with cross-sectional (bucco-lingual), axial, coronal, sagittal, cephalometric and panoramic views are easily generated. Three-dimensional images enable a level of anatomical accuracy and patient care not possible with 2-D technologies. With the addition of cone-beam CT technology in our office, our practice is committed to providing innovative, high-quality, patient care.